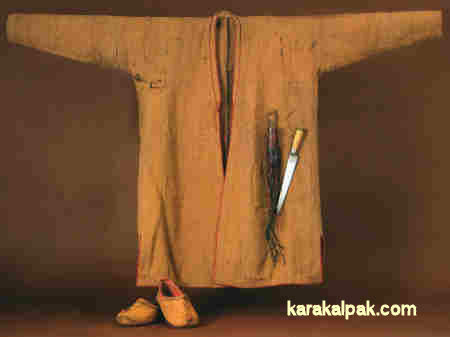 The Karakalpak shekpen is a long-sleeved overcoat or khalat made from homewoven camel wool cloth, or shal, which is normally light beige to mid brown in colour. It has a fairly straight cut, is nearly always unlined, and has no pockets. The front of the coat is overlapping and unfastened, while the collar is narrow, standing up behind the neck but lying flat on the chest at the front. There are lower vents in each side seam for ease of movement. The top underside of each sleeve usually has an opening rather than a gusset, the edges of which are sometimes finished with piping. As regards to decoration the outer edges of the collar, front openings, lower hem, side vents, and cuffs are finished with raspberry red silk jiyek. Often the inside edges of the front and bottom are lined with a narrow strip of Khivan or Bukharan adras or other brightly coloured cloth. Some shekpen are decorated with modest amounts of embroidery around the lower side vents and the collar. wide raspberry red jiyek, decorative embroidery on the collar and side vents, and two bunches of tassels. It was originally owned by a wealthy bay of the Qoldawlı clan from Shege near Moynaq. Research conducted by the Khorezm Expedition among local Karakalpaks living in the Aral Delta in the early 1970s confirmed that shekpen were always made from textiles that included camel wool. They were sometimes referred to as a ju'n shekpen (wool coat) or a shal shekpen (camel wool coat). 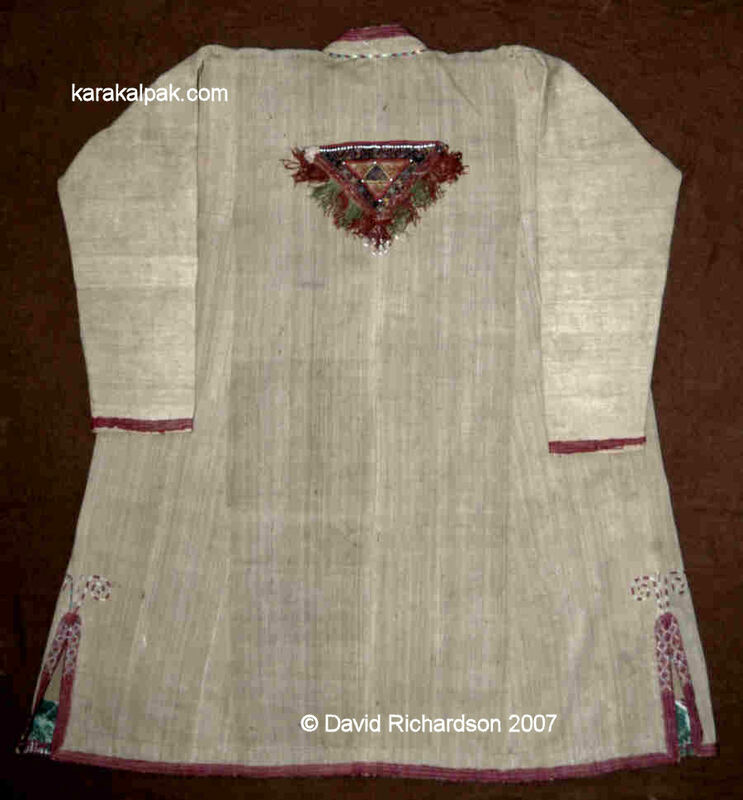 The same Karakalpak shekpen showing the back view. The protective jawırınsha sewn onto the back and the front tassels show that this was an exceptional high-status garment. Shekpen have always been expensive articles of clothing, worn by wealthier men or reserved for special occasions. They were often worn as an outer coat, the wind and water resistant qualities of its camel wool composition making it ideal for use in the rain or snow. In the summer they could be worn over just a shirt, but in colder weather they might be worn over a shapan or jacket and perhaps a fur-lined coat or ishik as well. Consequently they were usually made with a generous cut. In the past light brown shekpen were worn by young and middle-aged men and white shekpen by the elderly. By the mid-20th century their use was mainly confined to the older generation, but today they are rarely ever seen, except among the neighbouring rural Turkmen. 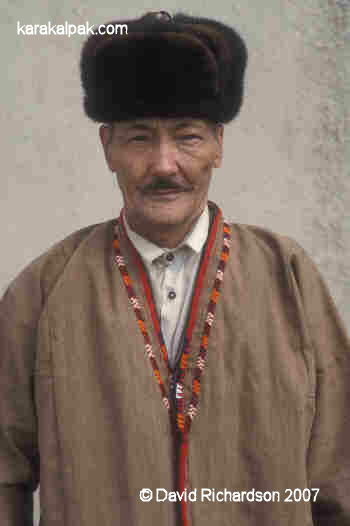 Although the Karakalpaks and the Qazaqs refer to unlined camel wool coats as shekpen, the Kyrgyz call them chekpen, the Turkmen and semi-nomadic Uzbeks use chekmen or chakman, the Tajik chakman, the Bashkirs sekmen, and the Arabs of both the Kashkadarya viloyati and the Karakulsk region of the Bukharan viloyati call them chakmen. However in Afghanistan they are called a chogha, possibly a word of Mughal origin, which has subsequently become the generic name for a sleeved outer coat in parts of India, especially in Kashmir and the Punjab. The same term was used by some writers in Bukhara during the mid-19th century. We should perhaps note that in one of her earliest reviews of Karakalpak costume, written just after the war in 1945-48, Zhdanko referred to such khalats as chepmen. The word chekman is of Turkic origin. It appears as the Qipchaq word cekman in the 14th century Codex Cumanicus, where it referred to woollen clothing in general. 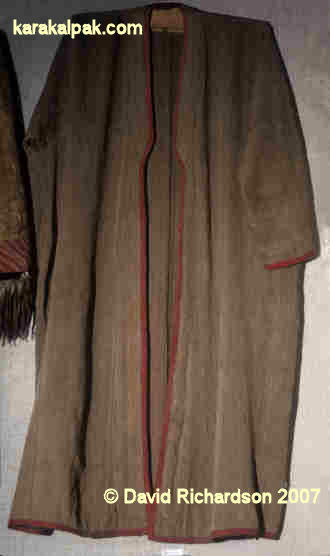 According to Clausen's Etymological Dictionary of pre-thirteenth century Turkish, a chekrek was a Seljuq woollen coat worn by the lower classes. Khalats made from camel wool were worn throughout Central Asia, not just by the Karakalpaks. They were also found in the Volga and lower Urals, in parts of Northern Iran and Afghanistan, and in Mongolia. 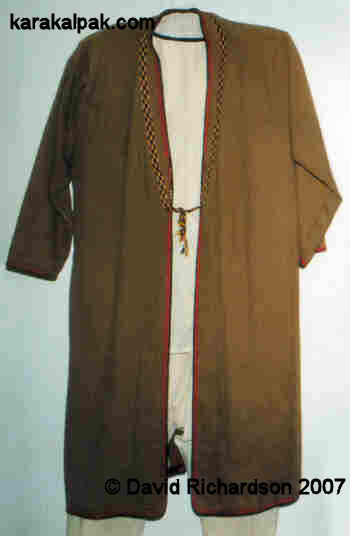 The chekmen coat was especially popular among the Turkmen who sometimes referred to them as a doye chekmen, meaning a camel coat. Travellers and scholars who visited Turkmenia during the 19th century unanimously commented on the widespread occurrence of chekmen overcoats. According to ethnographical field studies their manufacture was mainly confined to those Turkmen communities involved in camel-breeding � the Yomuts of Khorezm, the Goklen of the Balkhan region, the Qizil Shikhs of the Middle Amu Darya and the Saryks of the Merv, Iolotan, and Pendin oases in the Murghab delta. The more settled Turkmen, such as the Emreli and the Karadashli in northern Khorezm, tended to purchase their chekmen from the neighbouring Yomuts. Today many Turkmen living in the rural parts of the Aral and Sarykamysh deltas still posses a chekmen, which they reserve for special occasions. The Yomut Turkmen schoolmaster from the village of Bent, close to Sarykamysh Lake, modelling his precious chekmen. Detail of the Yomut chekmen showing the embroidered collar. The Qazaqs too produced their own shekpen. Shalekenov, writing in the mid-1960�s, noted that even then some elderly Qazaq women in the lower Amu Darya were still sewing shekpen from homemade camel wool broadcloth in the traditional manner. The finest Qazaq shekpens were known as shide and were made from the wool of one-year-old camels. By contrast the Karakalpaks of Khorezm were cattle-breeders and the ownership of camels was quite rare. During the 19th century and up to the era of collectivization in the early 1930s camels were only kept by the wealthiest bays, and even then for exclusive use as pack animals for the transportation of heavy loads. Riza Quli Mirza noted in 1875 that the Karakalpaks had almost no camels, "and even if there are one or two, then in the opinion of the local people, they always belong to one of the rich." 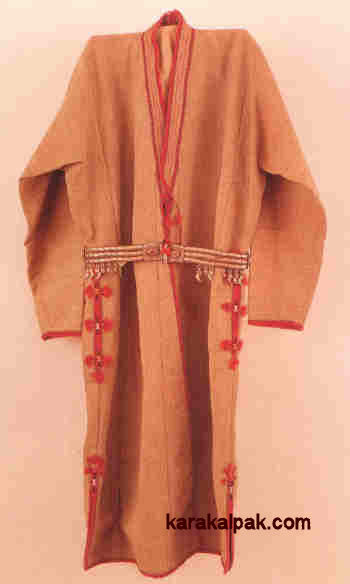 Interviews conducted by ethnographers from the Khorezm Expedition revealed that although rich Karakalpaks used camel shekpen as popular items of wear for festivals and holidays, they were generally either purchased from the neighbouring Qazaqs or were made by Karakalpak women from camel wool purchased from Qazaqs. Anna Morozova, writing in the 1950s, believed that the Karakalpaks purchased their camel wool cloth or shal not only from the Qazaqs but also from the Turkmen and used it solely for making shekpens. A Karakalpak shekpen from Qanlıko'l, formerly Leninabad, just south of Qonı'rat. The shekpen was obviously initially acquired from the neighbouring Yomut Turkmen. The one source of dissent comes from the writings of G. P. Vasilyeva, who claimed that the Karakalpaks did not make their own shekpens. This could be a general assumption made after encountering a specific instance of Karakalpaks purchasing such a coat from another tribal group. After all, the weaving of shal would have been a relatively undemanding task for the average Karakalpak woman during the 19th and early 20th century. According to A. D. Grebenkin the Karakalpaks of the Zeravshan region were certainly weaving their own camel wool cloth at the end of the 19th century. Chekmen or shol chekmen were not only worn by the semi-nomadic Uzbeks but also by the more settled agricultural and urban Uzbek populations in Khiva, Bukhara, and Samarkand. A man from Khiva with a long plain chekmen over his chapan, accompanied by his elderly father. Photographed by Ole Olufsen in 1899. Photo in the National Museum Archive, Copenhagen, catalogue number 173. 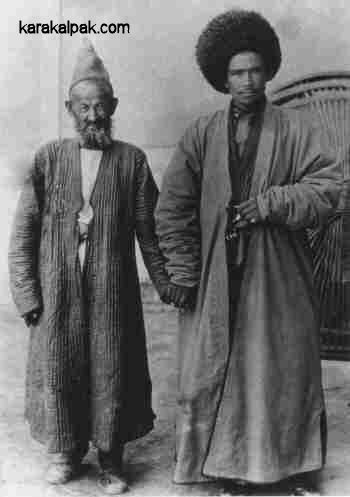 In their study of the Uzbeks of Khorezm, Zadykhina and Sazonova noted that the chekmen was worn constantly by shepherds tending their sheep on the steppes and pastures. Within the more settled Uzbek population it was regarded as clothing reserved for a special occasion, especially among the elderly men who wore them for holidays (toy) and funeral repasts (sadaka). The Uzbek chekmen was apparently worn in different ways within the oasis � the Southern Uzbeks from the Hazarasp region wrapped the coat from left to right but the Northern Uzbeks from the Shavat (Biruniy) region wrapped it from right to left. The Kyrgyz chekpen was widespread in both the northern and southern parts of Kyrgyzstan where it was considered to be a highly fashionable item of attire and was never worn as everyday working clothing. According to interviews with elderly men conducted by Russian ethnographers after the Great Patriotic War, piyazi chepken or basma chepken were a traditional item of clothing for the groom at his wedding or alternatively were given as prestigious gifts. For example in the past a chekpen might have been presented to a boy on the day of the feast to celebrate his circumcision, the sunnat toy. 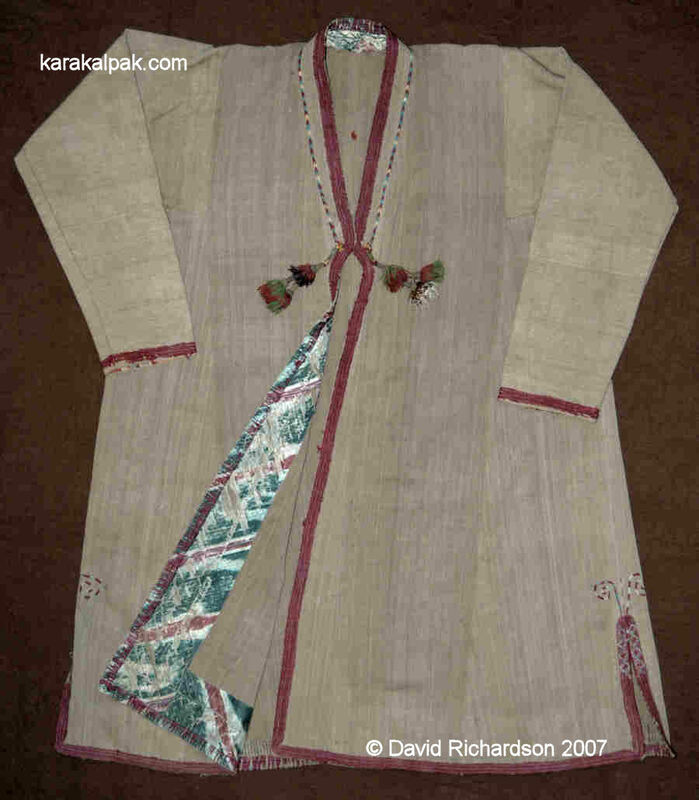 In Afghanistan the chogha was worn throughout the year despite being more appropriate for the colder weather. According to Henry Bellew at the time of his visit in 1857 there were three different types. 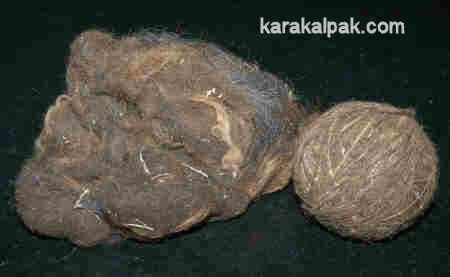 Baraki chogha were the most common and were made from the undyed wool of the rufus-coated sheep. Shuturi chogha were more exclusive, being made of camel wool. They ranged in texture and colour from coarse reddish brown to very fine and soft pale fawn or white, the best quality coats being richly decorated with embroidery. However the finest and most expensive chogha of all were the kurki chogha, made from the wool of the highland goat, which produced a cloth with the quality of a heavy Kashmir pashmina. In Iran the unlined camel wool coat was called an 'aba. It was worn by all classes of men apart from the lowest. In the 19th century camel wool cloth was exported from Central Asia to Russia where it was used to make woollen overcoats and even the upholstery for furniture. The word chekmen was even used to describe the long woollen regulation overcoat worn by some Cossack regiments during the winter months from 1 September until 1 May. Such coats were worn by the Don, Ukrainian, and Siberian Cossacks during the 19th and early 20th century, including the disastrous Russo-Japanese War of 1904-1905. Russian authors frequently referred to the camel wool cloth as armyachin, a Russian generic term for a heavy cloth (an armyach or armyak was a peasant's coat made from heavy cloth). 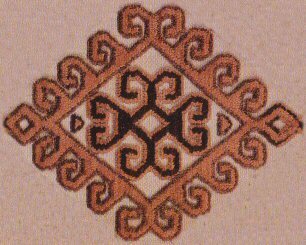 The Karakalpaks refer to such textiles as shal, the Uzbeks of Khorezm call them shal or shol, the Turkmen call them chekmen, and the Kyrgyz call them basma, taar or piyazi. In the past woollen homespun cloth was prepared and woven across all parts of Central Asia, not only among the nomads and livestock-breeders but in the communities of settled agriculturalists as well. It was exclusively a female occupation. Wool was gathered from sheep and camels and down and hair was obtained from goats. After spinning the wool was woven into narrow lengths of cloth, no more than 20 or 30cm wide, using the crude horizontal type of o'rmek loom. Woollen cloth was always woven in simple plain (tabby) weave. Camel wool was highly valued, its hollow fibres somewhat similar to cashmere wool producing extremely warm and lightweight textiles. Bactrian (two- humped) camels (Camelus bactrianus) have two coats: a warm inner coat of down and a rough long and hairy outer coat. They shed their coat in June and July in clumps that contain both inner and outer coats, producing roughly 7kg of wool annually. This is collected and the down is separated, cleaned, and tightly spun by hand to produce a fine thread. The down fibres are roughly 2cm to 8cm long. Generally the finest and softest under wool from the hump and neck of the camel was selected for making cloth to produce shekpen-type coats. By contrast the hair of the Middle Eastern dromedary camel (Camelus dromedarius) is short and coarse, and not suitable for spinning and weaving. A pile of raw camel wool and a ball of spun camel wool. The skeins of spun wool were specially treated prior to weaving. For example Tomina studied the Yomuts of Khorezm who boiled them in a weak solution of wheat meal for 20 to 30 minutes to make the threads smoother and more durable. The camel wool cloth was woven from single warp and weft threads, the warp sometimes being pre-treated with either milk or yet more wheat meal solution. The wefts were tightly compacted with the beater to produce a dense warp-faced weave. Given the narrow width of the camel wool cloth it took up to 25 metres of 23cm-wide cloth to make one khalat. The body of the coat had to be sewn from two widths of material, additional wedges of cloth being added at the front and at the back. Likewise the tapered sleeves were made from four strips of cloth, sewn together side by side. A drawing showing the construction of an Khorezmian Uzbek shol chekman. From Zadykhina and Sazonova, 1979. Women of the Turkmen Saryk tribe from the Iolotan region to the east of Ashgabat were famous for the production of a very fine camel wool cloth known as agari. During the preparation of the yarn they used salted dough. This was kneaded with water to create a milky fluid, which they called peti. The peti was boiled until it reached a sticky stage and the yarn was then immersed, covered, and boiled for a further two hours. After this procedure the yarn became durable and acquired the appropriate colour. The addition of silk to the yarn resulted in such a fine, high- quality textile that a loom length could be passed through a wedding ring just like a fine pashmina. In the early part of the 20th century, chekpen made from agari cloth became highly valued and so much in demand that they began to be manufactured for sale and many were exported beyond the borders of Turkmenia. Among the Uzbeks the camel wool chekmen was worn both by the rural population and the townspeople. However the evidence for camel-breeding among the Uzbeks, and consequently also the use of camel wool for weaving, has only so far been established for the formerly semi-nomadic Dasht-i Qipchaq Uzbeks. The information was gathered by A. D. Grebenkin from the Uzbek Qipchaq, Turkmen, Nayman, and Tuyakly tribes at the very end of the 19th century. Karim Shaniyazov independently recorded the use, "although insignificant in quantity", of camel wool for the sewing of men's outer khalats by the Qipchaqs of Zeravshan, who lived on the boundary of the oasis and the steppe. Field research conducted by Tomina established that camel wool chekmen were also made by the semi-nomadic Dasht-i Qipchaq Uzbeks of Kyrk, and the Nayman of the Jizzax oblast of the Uzbek SSR. It is also possible that the semi-nomadic Uzbeks of Northern Khorezm produced their own camel wool cloth. N. G. Borozny, who studied the Uzbek-Durmen of Khorezm, discovered that local wealthy Durmen "purchased white cloth made from camel wool from the Qon'ırat, who were involved with camel-breeding." However according to the observations of G. P. Vasilyeva, the settled Uzbeks of Khiva were just like the Karakalpaks of Khorezm and did not make their own camel wool chekmen. Henry Lansdell recorded that in the early 1880s a cloth known as basma, "a cloth of camel's hair for winter clothing" was mainly woven in Ura-Tube (south-west of Khojent) in Samarkand oblast and was usually of a cinnamon brown or black colour. Kyrgyz piyazi was greatly valued for its strength and beautiful natural light beige colour. Large quantities of piyazi were exported to Russia during the 19th century. Weaving from camel wool was also recorded among the Central Asian Arabs at the end of the 19th and the beginning of the 20th centuries. Kh. I. Ismailov recorded the production of malla chakmen from camel wool by the Arabs of Kashkadarya oblast. Similar fieldwork by Tomina in the mid-20th century established that the Arabs of the Karakulsk region of the Bukharan oblast of the Uzbek SSR manufactured their own camel chakmen. Outside of Central Asia, camel wool cloth was produced on the Arabian Peninsula, in Afghanistan, Pakistan, China, and Mongolia. The Regional Studies Museum in No'kis was the only museum to have a Karakalpak shekpen on public display. Unfortunately this museum is currently homeless - a situation which we hope will soon be remedied. The only Karakalpak shekpen formerly on public display in a museum. Photographed with the kind permission of the Regional Studies Museum, No'kis. This shekpen is made from coarse, khaki-coloured camel wool. The outer edges are finished with a binding of raspberry-coloured cotton while the inside edges are lined with a narrow border of striped commercial cotton. According to Esbergenov two of the earliest Karakalpak shekpen to be collected were given to the Museum of Ethnography of the USSR by the Karakalpak Branch of the Science Research Institute in 1933 (inventory numbers 22760T and 22761T). The first was made from light brown camel wool cloth and was seamless on the shoulder. The second was made from white camel wool cloth and unusually had been lined with red floral printed cotton. Both were straight cut and had been edged with red jiyek. They were 134cm and 142cm long, respectively. In both cases the camel wool shal had been made in Karakalpakstan. The Karakalpak shekpen, inventory number 22761, collected in 1933. Now in the collection of the Russian Ethnography Museum, Saint Petersburg. In 1968 the Khorezm Archaeological and Ethnographical Expedition purchased one example of a ju�n shekpen. It was given the inventory number 68-86 in the Karakalpak Branch of the Academy of Sciences of the Uzbek SSR. The Danish National Museum has a Turkmen chekmen in the collection of Ole Olufsen, collected in Merv in 1898-99 - see photograph at the end of the following (shapan) section. The coat is 121cm long. The Turkmen tribe is not recorded, although the Tekke were the main inhabitants of the oasis at the time of Olufsen's visits. Examples of Turkmen chekmen are held by the Museums of Ethnography in Ashgabat and Mary in Turkmenistan. A simple Turkmen chekmen, photographed in 1996. Courtesy of the Regional Ethnography Museum, Mary, Turkmenistan. A finely decorated Turkmen chekmen, listed as either Tekke or Saryk. Claimed to be either late 19th or early 20th century. From the collection of the National Museum of History and Ethnography, Ashgabat, Turkmenistan. The spinning and weaving of sheep's wool into cloth is believed to have taken place several millennia after sheep were first domesticated in the Fertile Crescent. The first domesticated sheep had a hairy or kempy coat, too coarse and brittle for spinning. Weaving could only take place following the development of breeds of woolly sheep, believed to have occurred at some time during the 5th millennium BC. By the 4th and 3rd millennium BC there is ample archaeological evidence to confirm the widespread production of woollen cloth in numerous weaving centres, such as the Sumerian city of Uruk in Iraq, Tell Mardikh in Syria, Novosvobodnaya in the Caucasus, and Mohenjodaro in the Indus Valley. Indeed wool became so important in one part of Iraq that it became known as the "land of wool" or Babylon. Towards the end of the 3rd millennium the elite of Altyn-depe in the south of modern day Turkmenistan were being buried in fine woollen funeral shrouds. By contrast we have little idea about when the first cloth was produced from camel wool. It was thought that camels were first domesticated on the Arabian Peninsula at some time during the 3rd millennium. Yet recent research by the Uerpmanns indicates this may not have happened in south-east Arabia until the early 1st millennium BC. Obviously camels were subsequently bred for their endurance and load carrying abilities, not for their wool, so it is quite possible that woollen moults from wild camels may have provided suitable fibres for weaving long before the existence of woolly sheep. So far however we lack any evidence. A two-strand cord of camel wool was excavated from a Third Dynasty (2686 - 2181 BC) site at Faiyum, Egypt, showing that camel wool was being used at that time but not necessarily for weaving. However certain taxes suggest that camel wool was being woven in Egypt by the time of the Romans. Numerous archaeological finds of camel wool fibre in textiles have been uncovered at various sites across Eurasia. For example the 3rd century BC burial at Ukok, in the Siberian Altai, contained a high-status female wearing a skirt woven from camel and sheep wool. Finds dated from the Roman era at an ancient port discovered at Quseir al-Qadim on the southern Egyptian Red Sea coast included a few camel wool textiles, as do those from 2,000 year old sites in Gaza. Meanwhile more recent analysis of some of the 700 textile fragments excavated by Sir Marc Aurel Stein in Xinjiang between 1900 and 1916 have identified camel hair fibres in just three textiles from two sites: the 4th century AD site of Loulan and the 8th century site of Mazar-tagh. The impression given from all of these finds is that camel wool was a fibre of minor importance among early weavers. Simple undyed woollen khalats and tunics were in widespread use among the ordinary settled populations of the early Islamic world. In the 8th and 9th centuries a new form of mystical Islam emerged in centres such as Baghdad, Kufa, and Balkh the supporters of which emphasized their humility by dressing in simple woollen garments. The new movement became known as Sufism, derived from suf, the Arabic word for wool. By the 10th century the economy of Khorezm was growing fast, thanks to the political stability established by the Samanids. The increasing need for merchandise to exchange with the nomads led to a considerable development in the production of woollen and cotton fabrics, and Gurganj (Konya Urgench) became an important centre for the manufacture of woollen garments. The mid-10th century Arab geographer Ibn Haukal recorded that "Kuarezm is a town well supplied with provisions ... Linen and wool are manufactured there ..." Indeed in 922 Ibn Fadlan purchased his own locally made woollen caftan in Gurganj for his embassy to the Bulghars. The 10th century Arab traveller Ibn Muhalhal mentioned that the Ghuzz wore clothes of linen and of camel's hair. At this time the Ghuzz, who would later be called the Turkmen, roamed in the region of the Aral Sea, including the lower Syr Darya and the Ustyurt. The first historical mention of camel wool cloth in the lower Amu Darya region occurred in the early 13th century. Chinggis Khan dispatched two caravans of prestigious gifts to the Khorezmshah Muhammad, both of which included expensive fabrics called targhu, made from the hair of white camels and valued at over 50 dinars a piece. The second caravan was intercepted by officials at Utrar in 1218 and its participants massacred, a pivotal event that led to the subsequent Mongol invasion of Khorezm. Just over half a century later Marco Polo discovered that fine camel wool cloth was manufactured in abundance around Ninghsia in the Kansu Province of China. However Chinese sources indicate that camel wool cloth was previously imported into China from western Asia. The Chinese referred to the cloth as mao-tuan, meaning "hair satin". The records were made in the early 13th century by Chao Ju-kua, the Sung Inspector of Foreign Trade in Fukien, although they were based on earlier sources. They stated that camel-hair satin of all colours was produced in Chi-tz'u-ni, a probable reference to Ghazni in Afghanistan. A later reference indicated an Asia Minor or Persian origin for the same type of cloth. References to camel wool cloth and shekmen-type coats are surprisingly few and far between during the post-Mongol period, even in the 19th century Eurasian travel literature. Peter Rychkov commented in 1762 that the Qazaqs traded camel wool with Russian buyers in Orenburg. A little later in 1772 Johann Georgi recorded that both the Qazaqs and the Kazan Tartars made camel wool cloth. The Qazaqs bred both one and two humped camels, but the two humped produced more "of that sort of wool called camel's hair". Even so they could harvest 12 pounds [5½ kg] of wool from one of their dromedary camels a year, which they sold to the Bukharans or else converted into camel wool and cord. Meanwhile some of the Kazan Tartars made a fine camlet called armaik from undyed camel hair on a ground loom. When Muravyov travelled to Khiva in 1822 he briefly noted that "The Turcomans wear coats of yellow camlet, made of camel's hair." He also recorded that the settled Turkman in the Khivan oasis manufactured camlets, while the Khivans purchased their camlet from "the surrounding nomads", among which were the Tukmen (and the Karakalpaks and Qazaqs). Arthur Conolly spent time with the Eastern Turkmen in 1830 and observed that the costume of the men was very similar to the Uzbeks - they wore an outer camel hair jubba, belted at the waist, and a large sheepskin cap. The camel hair for the jubba was prepared by the womenfolk. 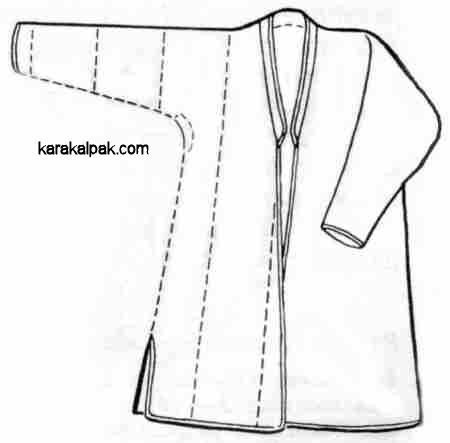 The word jubba is a term used in the Middle East and India for a plain outer coat. They are frequently worn today by clerics and imams. In early 1840 Captain James Abbott passed through Merv on his journey from Herat to Khiva. He had brought an Arabic book of prayers as a gift for a well-known local Sufi priest, who entertained Abbott in his home. As a sign of hospitality after the completion of a lamb pillau, Abbot was presented with "a chogha, or cloak of camel's hair". Chogha is another Indian word for an outer coat. During 1863 Arminius Vambery travelled from the Upper Murgab to Herat via Kalè No, where he observed that the local merchants had just received a large purchase of berek, "a light cloth for the fabrication of which the Hazara women are renowned, and which is employed throughout the whole of the north of Persia and Afghanistan as an over garment, called a chekmen". A little later in his "Sketches of Central Asia" published in 1868, Vambery described the costume of the Central Asian man and noted that the chekmen was worn as an extra garment in winter. He described it as "of ample dimensions and made of coarse stuff". His report on his trip from Khiva to Qon'ırat, undertaken five or more years earlier, mentions that in Qon'ırat town they held large fairs for conducting commerce with the surrounding nomads. One of the important commodities traded was camel's hair. Further east in the Gobi Desert at some time in the 1880s, Frances Younghusband observed that a beautifully soft warm cloth was woven from Mongolian camel wool "which nothing could be better for wear in winter". At roughly the same time Henry Lansdell was visiting Petro-Aleksandrovsk and recorded the price of local camlet on the bazaar - 3 shillings and 9 pence a yard. Lansdell called it camlet for ladies dresses and noted that it was the finest material of bona fide camel's hair that he had seen. Earlier in 1882 he had observed Qazaq nomads taking camel hair to the bazaars of Semipalatinsk to trade for commodities such as grain, flour, and tobacco. 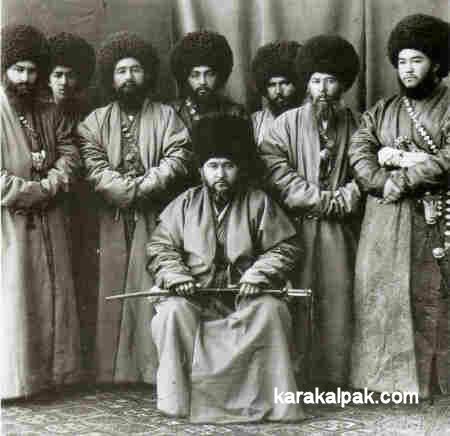 Sayyid Muhammad Rahim Bahadur Khan II (1864-1910) surrounded by some of his ministers in Khiva. 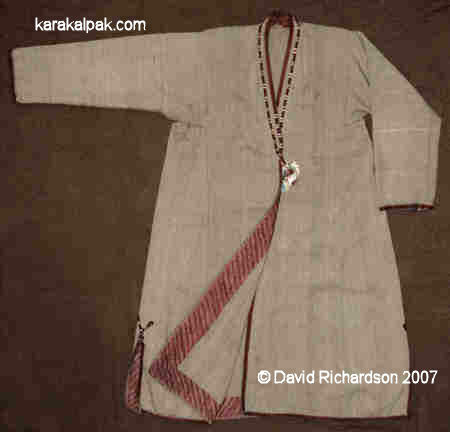 The chekpen was worn over an alacha chapan. Photographed by I. Volzhinsky, not later than 1896. Turning back to the east William Rockhill referred in 1892 to a place in China called Chung-Wei Hsein, where Chinese merchants were selling camel wool to foreigners in significant quantities. "Over the proper caftans (don) they wear on travels a wide caftan, chapan of yellowish brown camel's wool as over-coat, rain or dust-coat to shelter the finer caftans from the hard wear on horseback." Olufsen's Turkmen chekmen from Merv, now in the Danish National Museum, Copenhagen. 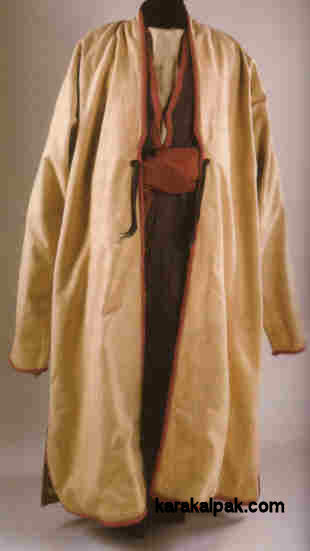 Olufsen purchased one Turkmen camel wool coat in Merv in 1898-99, with a narrow collar, described as a kaftan (don). Its inventory number is 115. Our final reference comes from Ella Maillart who made a brief stop at a small hamlet between Shımbay and Taxta Ko'pir in the winter of 1933. While waiting for her fried fish she witnessed the arrival of "two elegant couples of Karakalpak riders", the two male escorts both dressed in "camel-hair chapans". Bellew, H. W., Journal of a Mission to Afghanistan in 1857, Smith, Elder & Co., London, 1862. Conolly, A., Journey to the North of India, Overland from England Through Russia, Persia, and Affghaunistaun, Volume 1, Richard Bentley, London, 1834. Esbergenov, X., Chapter 2, Costume [in Russian], in Ethnography of the Karakalpak from the 19th to the beginning of the 20th century, Published by Fan, Uzbek SSR, Tashkent, 1980. Grebenkin, A. D., Uzbeks, in Russian Turkestan [in Russian], pages 51 to 108, Issue 2, Moscow University Press, Moscow, 1872. Maillart, E K, Turkestan Solo, translated by John Rodker, G P Putnam's Sons, New York, 1935. Olufsen, O., The Emir of Bukhara and his Country, Elibron Classics, facsimile of 1911 edition, 2002. Riza Quli Mirza, Brief Description of the Amu Darya Region. Saint Petersburg, 1875. Rockhill, W. W., Diary of a Journey through Mongolia and Tibet in 1891 and 1892, The Smithsonian Institution, Washington, 1894. Rychkov, P. I., Topography of Orenburg Province [in Russian], originally published in monthly installments in 1762, republished by Kitap, Ufa, 1999. Ryder, M. L., Camel and Yak Hair on the Silk Road, Archaeological Textiles Newsletter, Number 26, pages 20 to 21, Spring 1998. Shakanov, T., Editor, Kazakh National Costume [in Russian], Publisher Zhalyn, Alma Ata, 1976. Shaniyazov, Karim Sh., The Ethnic History of the Uzbek People [in Russian], Tashkent, 1974. Shaniyazov K. Sh., and Ismailov, Kh. I., Ethnographical descriptions of the material culture of the Uzbeks from the end of the 19th to the beginning of the 20th Century [in Russian], Tashkent, 1981. Sobolyev, L., Letters about the Amu Darya Expedition [in Russian], Russian Invalid, Number 213, 1874. Spring, L., The Cossacks 1799 � 1815, Osprey Publishing, Oxford, 2003. Tomina, T. N., Cloths in the clothing of the nomadic and semi-nomadic peoples of Central Asia [in Russian], Traditional Clothing of the Peoples of Central Asia and Kazakhstan, pages 228 to 252, Nauka, Moscow, 1989. Uerpmann, H-P., and Uerpmann, M., The Appearance of the Domestic Camel in South-east Arabia, The Journal of Oman Studies, Volume 12, pages 235 to 260, Ministry of Heritage and Culture, Sultanate of Oman, 2002. Vambery, A., Travels in Central Asia, 1863, reprinted by Praegar Publishers, New York, 1970. Yazlyev, Ch., Turkmen Homespun Material "Agari", The Monuments of Turkmenistan, Number 1, Ashgabat, 1973. Younghusband, F. E., The Heart of a Continent, A Narrative of Travels in Manchuria, Across the Gobi Desert, Through the Himalayas, the Pamirs and Hunza, 1884-1894, Asian Educational Services, India, 1995. Yule, H., translator and editor, Cathay and the Way Thither, Medieval Notices of China, Volume 2, Note XII, Abstract of the Travels of Ibn Muhalhal, The Hakluyt Society, London, 1866. Zadykhina, K. I., and Sazonova, M. V., Men's clothing of the Uzbeks of Khorezm at the end of the 19th � beginning of the 20th century [in Russian], Costumes of the Peoples of Central Asia, pages 151 to 169, edited by O. A. Sukhareva, Nauka, Moscow, 1979. This page was first published on 11 March 2007. It was last updated on 26 February 2010.